1. Entries will be limited to two per farm or family per class. 2. Group classes will be limited to one per farm or family. 3. All entries must originate from a validated herd and have proof of validation. 4. 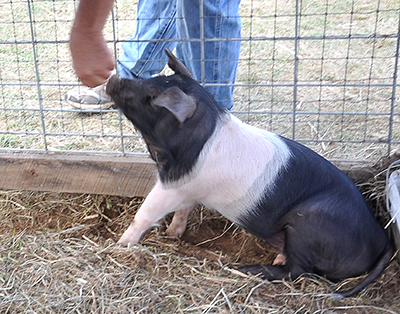 Herds must possess a valid Swine Inspection Report within the past six months and negative blood test for Brucellosis. 5. Registration papers and health papers will be checked by the Superintendent upon exhibitor’s arrival. 6. Animals must be penned by 9:00 P. M., Thursday and remain on the fairgrounds until 6:00 P.M., Sunday. 7. Dirty, sick or unruly swine will be evicted from the fairgrounds at the superintendent’s discretion. 8. Exhibitors must be present at time of judging. 9. Exhibitors must supply feed and hay; bedding will be provided. 10.Showing to be announced at fairgrounds. 11. Exhibitors are encouraged to decorate pens with educational information.